I am talking Santa’s red. It’s Christmas. C’est Noël! 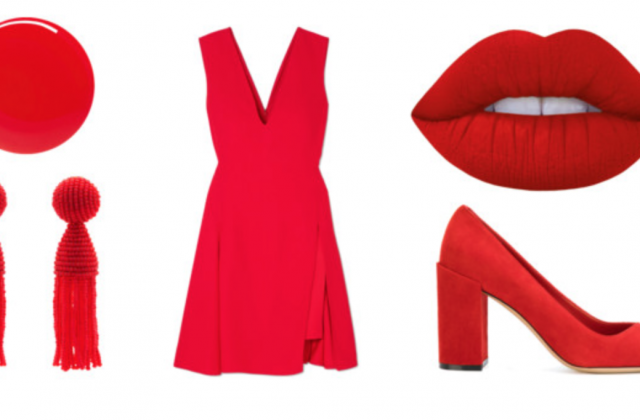 I know I already wrote an article about how to master bright red last year, but here it is how to wear it for a festive event such as Christmas eve. Without looking like you just robbed Santa’s Clauset. Classic and safe. Typically red to lighten up an all black outfit. As in red pumps with black jumpsuit. You are no Christmas canapé so avoid horizontal layering: a layer of red shoes, a layer of black tights, a layer of red skirt, a layer of black top. Prefer putting a base with something on top like red shoes and red pants topped with a black top. Red with a hint of gold… or gold with a hint of red rather than fifty fifty that may make you ressemble the Christmas tree. Less “Christmas magic” than the former, silver is easier to use with broader portions of red. Because it’s Pantone of the year, festive and unexpected. I recommend getting one as a main and the other as an accent in order to spare the retinas of other guests. Those neighbour colors are super close and you can mix them in the proportions you fancy. Not the good choice if you do not want to be the focus of all attentions. Thanks for this beautiful article. but I can’t see any images in this page. Moi qui aime le rouge, j’apprécie toutes ces bonnes idées pas seulement valables pour les soirées. Et le rouge le printemps et l’été ? Qu’en pensez-vous ? Comment le porter ? Quels sont les tissus qui “aiment” le rouge ? I love your blog, your fashion sense is just amazing. Thanks for sharing and happy new year! I like bright red toned down with wine hues the best! It’s unexpected, allows head-to-toe-red (which I like) and Looks sophisticated to me. Thaks for the interesting compilation here! They are my own fav as well! Un vrai régal, tant par les suggestions de tenue que par l’humour de la rédaction.